This also allowed the official Republican line, repeated ad nauseam, to be that ACA was “rammed down our throats.” If so, it was swallowed willingly, since they refused to participate in its creation. Since 2012, when Republicans took control of both houses of Congress, over seventy fruitless attempts have been made to abolish Obamacare. 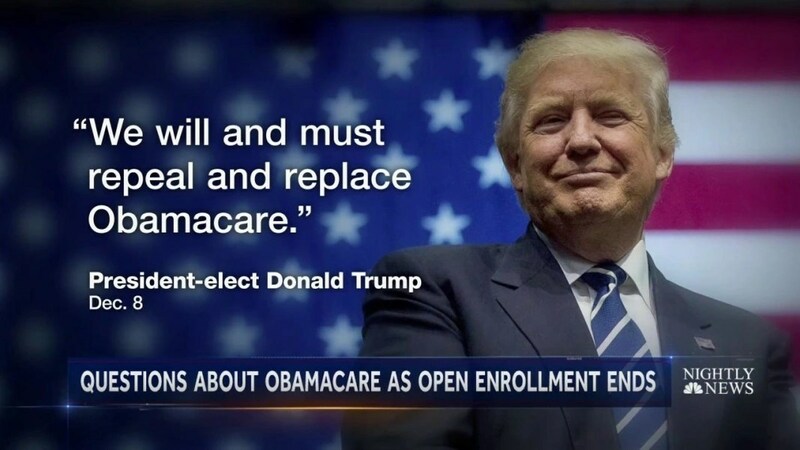 Now, as Obama leaves office and Donald Trump begins his presidency, Republicans see the opportunity to realize their goal, the repeal of Obamacare and its replacement by – as Trump said during the election campaign – “something terrific.” They have made it their first planned action, with the suggestion that repeal/replacement of ACA will be accomplished as soon as Trump takes office. That, of course, is hogwash. They cannot repeal Obamacare until they have something to replace it with, because they know what everyone else knows – that the system in place before Obamacare was unsustainable. Too many people had no or minimal health insurance, ambulance rides to hospital emergency rooms (which under EMTALA, a 1986 law passed by a bipartisan Congress and signed by Republican president Ronald Reagan, must treat all patients regardless of their ability to pay) functioned as doctor’s office visits for millions of Americans, and the cost of all that unreimbursed treatment had to be borne by everyone else. In addition, overwhelming debt from medical expenses had become the number one cause of bankruptcies in the USA, because some people were unable to get or keep insurance because of medical conditions they already had. The primary difference between the Heritage Foundation plan and Obamacare is the extent of coverage participants must purchase. The former mandates only low-premium/high-deductible/high co-pay coverage as its minimum, the latter mandates comprehensive coverage. During the eight years of Obama’s tenure, opponents of his health care program have railed against it, proposed its repeal countless times, and promised that they would abolish it as soon as they could. During that period, there was nothing from them about what would replace ACA. No one made any proposals other than “repeal and replace.” Now that circumstances have put them in a position to make good on their promise, the Republicans in Congress seem to have nothing prepared, six years without anything of any substance at all, to submit to their new president. They know very well they cannot simply abolish Obamacare and then work on a replacement for it. Twenty-million-plus Americans who have health insurance now will lose it, and the private insurance companies to whom Obamacare delivered all these new paying customers will notice their loss. It will take at least a year, and more likely two or more, to come up with a replacement. And that replacement will have to look an awful lot like Obamacare, because those who would repeal it say its best feature is guaranteed coverage for pre-existing conditions. That guarantee makes certain that a person seeking to buy health insurance cannot be turned down because they already have a disease or disability. Without the requirement, insurance companies could refuse coverage to someone with, say, diabetes or cancer, or anything else. What constitutes a “pre-existing condition” is decided by the insurance company. Someone with a pre-existing condition who, for example, lost employer-sponsored coverage would find it impossible to replace it. This starts a chain of consequences that cannot be dismissed. First, if you have a guarantee that pre-existing conditions must be covered, you must also have a requirement that everyone purchase insurance – an individual mandate. Without it, people would not seek coverage until they got sick. If you require everyone to buy insurance, not everyone will be able to afford it. If people who cannot afford insurance must acquire it, you must supply government subsidies for them to do so. What can a new program offer that will be different? Obamacare is close to the bare minimum. It is essentially the Republican-created system: free-market exchanges, no public option, and no free-loaders. There is one notable part of ACA that is original to it. The Heritage Foundation plan would require that people buy only catastrophic coverage, to help them avoid financial collapse in case of a serious long-term illness or injury. But that does not address the problem of everyday, non-emergency situations being fobbed off on hospitals, where such unreimbursed services now account for over six percent of all costs. Nor does it make sure that insurance premiums are affordable. In that regard, having barebones, minimal coverage (sometimes called “junk insurance”) is scarcely better than having no insurance at all, and having everyone covered – with their premiums paid for – is one of the three necessary parts of a workable system (the other two are coverage for pre-existing conditions and an individual mandate). If any of the three is eliminated or gutted, the program falls apart.